It’s well known that retaining a customer is cheaper than acquiring a new one. If you’re like most online businesses, you’re building an email marketing list. 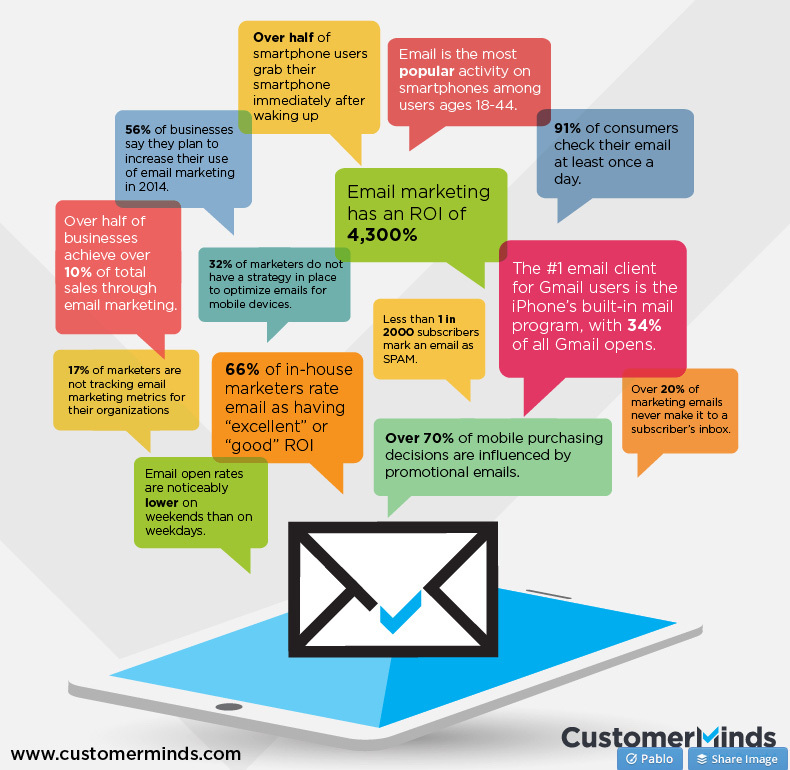 Email is the most effective sales channel and offers the highest return-on-investment of any marketing campaign. Email marketing’s effectiveness is actually increasing. Even if you don’t have use for an email list today, you should be building one so you have it when you need it. You may have other goals for your list, but we all share a common problem: retaining those subscribers. 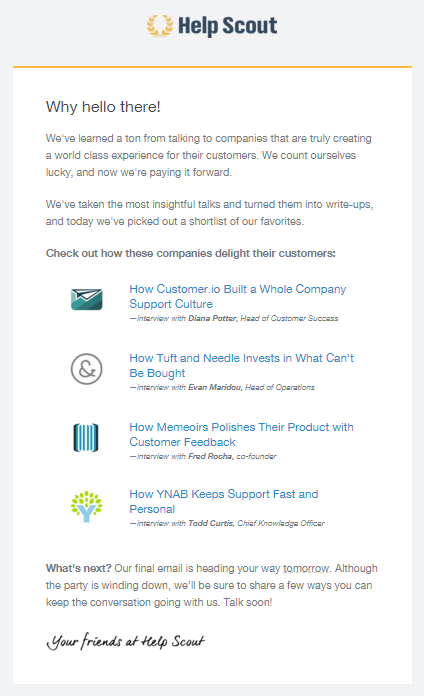 You have your own email goals, but we share a common problem: retaining subscribers. Figuring out what motivates someone to click “unsubscribe” can be tough. Once they’ve left your list, they’ve declared their wishes to be left alone, so there’s no polite way to ask why. Always remember that a certain percentage of unsubscribes is expected. It varies by industry, but most see a 22.5% rate of decay every year. To put you on the right path, here are some common reasons people remove themselves from your list. Strong inbound methodology doesn’t mean spamming your subscribers. It means sending them quality emails at the right time. Even if your content provides a ton of value, people will unsubscribe if they feel inundated. 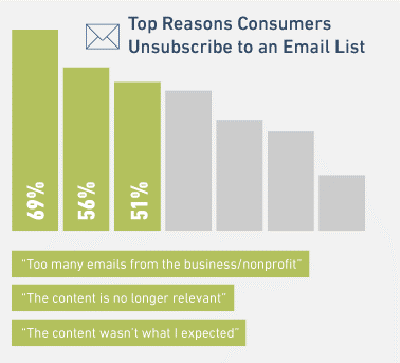 In fact, Constant Contact and Chadwick Martin Bailey (a market research firm) report that “too many emails” is the most common reason people unsubscribe. No one stays subscribed to help you out. Always provide value. This is a careful balance. If you send too few, you won’t make a strong impact. But if you send too many, you’ll create negative associations with your brand. This discourages people from doing business with you, which defeats the purpose. A good rule of thumb is to never send a blast if you don’t have anything worth saying. Never send an email because you “haven’t sent one in a while” or because “today is our scheduled day.” It’s better to adjust your schedule than send a low quality email. Never send an email blast if you don’t have anything worth saying. How often you should send isn’t always clear. Typically, I don’t recommend sending more than twice a week. You’ll have to do some testing to determine the best days, weeks, months and times to send emails, as well as the appropriate volume. 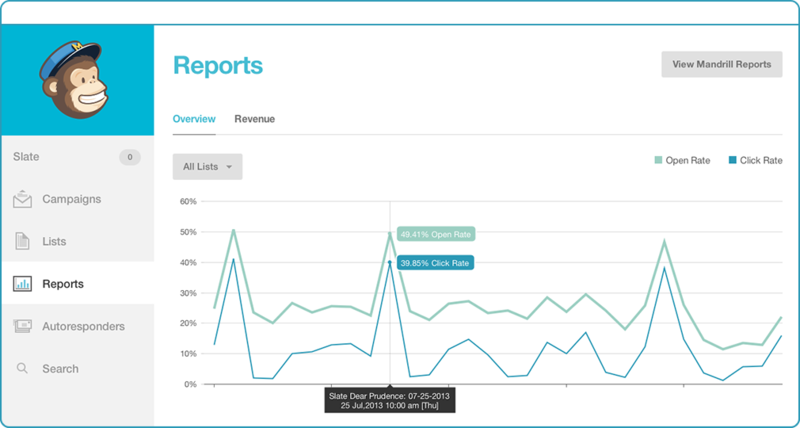 All of the popular email marketing platforms offer reporting dashboards to help you understand your campaign’s effectiveness. Typically, this happens for one of two reasons. 1. They subscribed to so many things that they can’t recall your name. Some people will sign up for any list, even multiple lists in the same day. I’m one of those people. One time, I ran into a blog post that was something like “the 20 best marketing lists you have to join.” I signed up for all 20 because it was easy. When the emails began rolling in, I couldn’t recognize a single name or brand. 2. You don’t have their express permission to send them an email. Surely you know that buying email addresses is rarely effective and prohibited by the big email marketing platforms. People will unsubscribe and mark your emails as spam in droves. Sometimes, however, you legitimately have their address, but the receiver doesn’t know it. For example, perhaps you contributed a product to a large giveaway where the receiver agreed to sign up to all of the brand’s lists. Even though you fairly received their address, the receiver doesn’t feel like they gave it to you. This happens a lot to eCommerce customers who don’t realize that by purchasing online, they’re also opting in to a list. You can mitigate unsubscribes in both of these instances by reminding the subscriber who you are and how they signed up. This is especially important if you haven’t sent out an email in some time. Do this before you get into the meat (sales/promotions/news/content) of your email. You should also make sure your first email is packed with value. It’s common for brands to use a value offering or giveaway to collect an email address, send a confirmation message or download link, and then add the person to their regular broadcast list. Many people never intend to be a subscriber. They just want whatever you are giving away. Or maybe they just want to buy that one product. Or maybe they have to use their email to create an account. In all of those examples, they never wanted regular messages. You could use a check box on your sign up form that lets them manually opt into your email correspondence. Truthfully, most people won’t. If you check the box by default, people will get angry, and that hurts your brand. I sympathize with marketers who wants to use tactics likes these to collect addresses. I’m guilty of it myself and I’ll continue to do it because it’s extremely targeted. If someone buys a product off your site, downloads a freebie, or creates an account, you know they’re the right audience for your content. Just keep in mind that a certain percentage will unsubscribe immediately. Most people don’t enjoy advertisements. We mute commercials and install ad blockers to purge them from our lives. It is unlikely that people will stay subscribed if you’re always trying to selling them something. People won’t stay subscribed to your email list if you’re always selling. I understand that your brand is probably a business. The whole point is to convert leads into paying customers. I get that. Some sales pitches and advertisements are to be expected, but immediately dropping a new subscriber into your sales funnel and bombarding your list with constant content focused on the brand (as opposed to the subscribers’ problems) are quick ways to turn them off. Follow the 80/20 rule. 80% of your content should be entirely helpful. Give it away entirely free. Anything you ask them to do shouldn’t cost a penny. This will establish you as an expert in your field who can solve their problems. When they do need help, they’ll be primed to respond to the 20% sales emails. When I say personalize, I don’t just mean using the receiver’s name in the copy (although that definitely helps). Personalizing means making sure the receiver is seeing something that matters to them. Too often, brands will blast an email to their entire list. They figure more people = more sales/sign ups/page views. That isn’t always the case. If a reader is constantly exposed to content that doesn’t matter to him, he’ll drop off the list. Segmentation is the practice of dividing your list into more defined groups. You can categorize people by anything you like so you can talk to them on a more personal level without bothering the rest of your list. MailChimp reports that segmentation significantly improves all of your email marketing performance indicators. For example, if you send out tips for salesmen, create a segment of people who work in a business-to-business capacity. Create another for business-to-consumer salesmen. If you have content that applies to only one group, you can email them without alienating the other. Don’t use the same sign up boxes on every page. Strategically place sign up forms depending on the content of that page. Let’s say you have a website about investing. You would put a sign up form on a blog post about day trading that funnels the subscriber into the day trading list or segment. On a blog post about value investing, you would include a form that pushes the subscriber into your value investing list/segment. You also should use segmentation to avoid making silly mistakes, like suggesting the subscriber request a demonstration after they already have, or sending basic get-started information to a practicing veteran. Furthermore, personalize your email marketing by bringing your new subscribers into the flow with a carefully crafted welcome series. First, send a transactional email that welcomes them to your list. Remind them what they can expect and offer some of your best content. 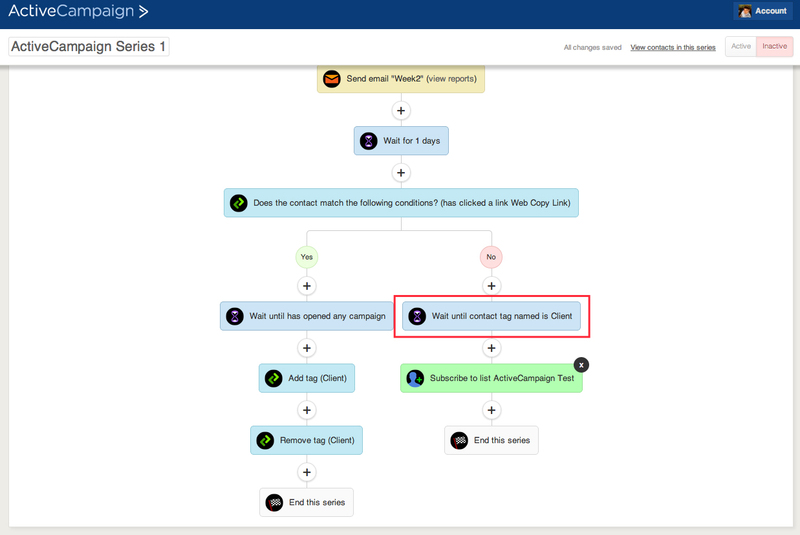 Use an email marketing platform with automation features to make sending a series easy. Depending on your industry and branding, you could send up to four more emails in a series. (I don’t recommend more than five.) Be sure to space them out by a couple days so you don’t pressure the subscriber. You don’t have to be a designer, but your email should look aesthetically pleasing. If you don’t care enough about your content to present it in a nice package, why should others? If you don’t care enough about your content to package it nicely, others won’t either. If the email looks cluttered and messy, people will assume it is spam. Make sure you proofread your emails before they go out to fix simple errors. Mobile devices are everywhere. More people use them for Internet-related tasks every year. A study by Litmus shows that 48% of emails are opened on mobile devices. If your emails look poor on mobile, you’re going to lose people. This is a tough request. Emails are written in an archaic HTML structure, similar to how websites were built back in the 90s. Getting them to collapse properly for mobile devices requires a talented designer. Furthermore, various email clients display HTML differently. Some clients permit CSS styles in a <style> tag; others don’t. Some interpret tags in odd ways or dismiss them entirely (yes, I’m talking about Outlook). An email doesn’t have to be elaborate to look tight and professional. Here’s a simple, easy-to-digest Help Scout email template. Strive to keep your emails clean and easy to read. The easy solution: use an email marketing application like MailChimp, Constant Contact, Active Campaign, or something similar. They all offer responsive templates and cross-client compatibility so you don’t have to worry about the design and structure. You can also send plain text emails if that’s appropriate for your brand. I once subscribed to an email list run by a guy named Mark who gave out writing tips. Once or twice a week, he would send a lengthy article on an obscure writing fact or concept. It was dense stuff. I loved it because I couldn’t find anything similar. After six months, he began to cover some of his previous topics. At first I dismissed it as my submergence in the discipline. I’m bound to read two articles on the singular “they” or how to cull adverbs. Shortly after, it became clear that Mark had run out of topics. He was lecturing on the same concepts over again. It was boring. After four consecutive repeats, I unsubscribed. Fresh content is imperative. Don’t expect your readers to suffer anything a second time (unless a recap is necessary for your new content). If you run out of things to say, you have to learn about new things. This is the hardest standard to achieve, but the most important. If people don’t feel like their lives are better (even in a small way) because of your email, they will cut communication. Your content needs to inform and inspire. It must be quality. It has to be clear, concise, and easy to scan. Poor through your analytics. What are people clicking? What are they ignoring? Which subjects returned the best open rates? Which calls to action were more enticing? Use this information to give your readers exactly what they want. Take care for the length of your emails. No one is going to read 3,000 words in their inbox. Nor will they think highly of a single sentence. Again, the only way to find the right balance is to mind your analytics and test. Some email marketing platforms present a one-question survey after the subscriber removes himself. The survey asks them to check why he unsubscribed. Most people don’t check an answer, but some will, so these surveys are worth employing. Building a list shouldn’t be a one-time deal. You need to constantly refresh your list with new subscribers via strong inbound marketing practices.